Vera Ingrid Grant, director of Harvard’s Ethelbert Cooper Gallery of African & African-American Art, notes that the name “Harlem” evokes many different visions. Some people recall the landmarks central to the Harlem Renaissance, like the Apollo Theater and the Lenox Lounge. Others see the designer stores and boutiques that have begun to emerge, often replacing historic buildings, the same way the Renaissance Ballroom is being replaced by an apartment complex. In some parts of Harlem, increases in rents have far outpaced income growth. The Cooper Gallery’s exhibit “Harlem: Found Ways,” featuring work by New York-based artists, seeks to make sense of this changing identity. Dawoud Bey’s Harlem Redux series. The first hallway and large room at the front of the exhibit display Dawoud Bey’s Harlem Redux series, a collection of color photographs documenting life in the neighborhood from 2014 to 2016. Most images feature street views and construction sites. In some photos, people are visible, but can’t be seen clearly—they are often turned away, or they appear in the background, or you can see only their hands. “Two Men Walking” shows two tiny figures walking on a sidewalk behind a giant concrete building, shrouded, as Grant puts it, by their urban landscape. This theme is also apparent in the way she arranged the photos in the gallery. The large prints are scattered across different planes; some hang at eye level, as you’d expect at an art gallery, but others lie face-up on blocks, so visitors stare down to see them. One sits on the floor, propped against the wall. Positioning photos in unexpected places, Grant hopes, prompts visitors to spend more time looking at them. New York at Dawn, a sculpture installation by Abigail DeVille, contrasts the city’s wealthiest with its poorest. In the center, a woman emerges, engulfed by tentacle-like shapes, a lampshade protruding from hair blown back by the wind. Her “arms, face, hair and miscellanea [are] packed together and yet exploding at the same time,” Grant wrote in an email. The installation also features stylized, plastic hanging heads that have strips wrapped around them where facial features should appear. Hanging behind the sculpture, the heads give the work a “sharp, dangerous element,” she says, and a “dystopic” view of residents “facing the daily challenges” of work and poverty. 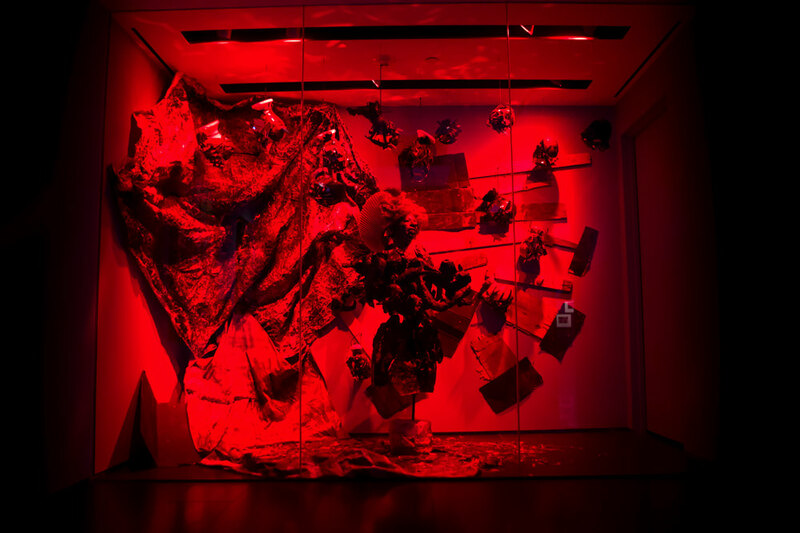 At the same time, red light is projected onto the installation, and shattered glass is scattered on the ground, which Grant says “conjures up the remains of a New York night of revelry, partying, and excess”—a privilege unaffordable to the city’s working poor. DeVille’s installation merges these two opposing perspectives into one piece, reflecting the extreme inequality between Harlem’s poorer residents and the elite displacing them. Despite the darkness of Bey and DeVille’s art, the exhibit does not feel pessimistic. One work by artist Nari Ward, Sugar Hill Smiles—a stack of short, flat cans bearing that label—references the historic Sugar Hill neighborhood prominent in the Harlem Renaissance. The piece is explained by an accompanying video, in which Ward hands out the cans to Harlem residents, which they open to find a mirror at the bottom, reflecting back a suddenly broad grin. In addition to making people happy, the cans represent “an intervention in the traumatic history of what happened with African American smiles through blackface and minstrelsy,” Grant says. Ward also sells the cans and donates the proceeds to support early education for Harlem children. “Harlem: Found Ways” will be on display at the Cooper Gallery until July 15.